There was a time when corduroy trousers were solely the preserve of middle age men and a hallmark of tragically unhip geography teachers. But they’re now firmly back on the fashion map, as well as cord shirts, trainers, hats…you name it. We’ve rounded up the best pieces from high-end fashion houses to high street favourites to help you master this trend without worrying you might look like your dad. Levi's jeans have been a top pick for denim for over a century, but why not switch things up with a cord shirt by the iconic brand? This Western shirt comes in a very wearable 'yellow' cord with cowboy details such as yoking and distinctive white poppers. Western details have been all over the catwalk for AW18, making this shirt very 'now', but cowboy-style pieces are a common feature of fashion collections every few years, making this shirt a good investment piece without a huge outlay. AG Everett Corduroys are a practical choice for the weekend, with a modern, slim-fit that will see you channeling the likes of Saint Laurent and Burberry, rather than M&S' Classic range. The trousers are made from stretch corduroy with a zip fly, slant front pockets and patch back pockets. Made in the USA, they're composed of 98% cotton, making them great for Autumnal days that aren’t too cold. Like many of AG's creations, the trousers have some vintage appeal, making them easy to wear and a simple way to update your look without too much effort. Autumn's changeable weather is beautiful, but can be a pain when it comes to getting dressed, making layers a great idea. 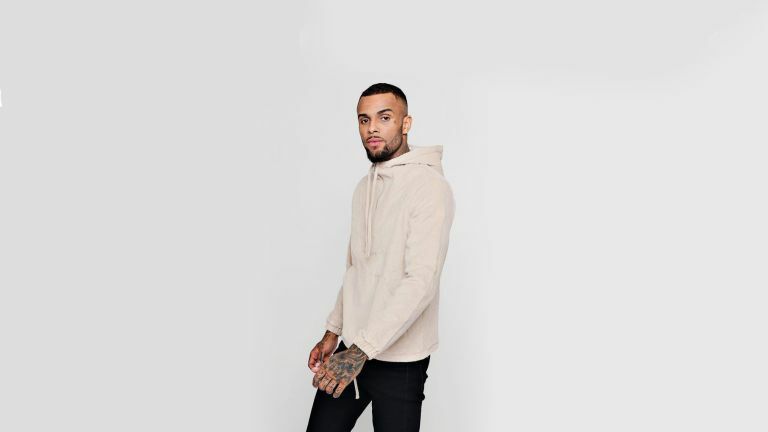 Boohoo's cord hoodie is a handy weapon to have in your fashion arsenal, as it's warm enough over jeans on a fine day, but useful under a coat too. The hoodie is made from 100% cotton corduroy and has a half zip, making it even more versatile. The elasticated cuffs add an interesting detail to the otherwise relaxed silhouette, while the cream colour means it will go with practically anything in your wardrobe - not bad for less than £30. A denim jacket is a wardrobe staple for many, but why not update your look this winter with a cord equivalent? Weekday’s Single Jacket is a timeless addition to an Autumnal look made from 100% cotton corduroy, making it perfect to throw on finer days. Cut in a boxy shape that taps in the trend for all things 1990s, it features flattering details such as a sharp collar, two buttoned front pockets and two hidden pockets at the front seam, silver buttons and visible seams. If purple is a little daring for you, the jacket comes in a forest green and classic black too. Rust is one of the hottest colours for this season so what better way to nail two trends at once by choosing an autumnal cord shirt? Cool brand YouMustCreate has a box fit shirt in Italian corduroy that can be worn buttoned up or open as a 'shacket' over a t-shirt. The versatile item has tonnes of pockets and is made from heavy duty Pima cotton fine 14 wale cord that's woven in Italy, which explains its heavy duty price tag of almost £200. But as a perfect mix of statement and functionality, you'll be sure to wear it for many years to come. The colour of Maison Kitsume's Nico cord chinos may be a classic, but their straight cut and details such as Italian pockets on the sides and a piped pocket on the back, gives them a retro feel. The trousers, which are made from high quality cord, have a raised elasticated waistline on the back with a small tightening strap giving wearers the perfect fit even if they gone out for a Sunday roast. The brand suggests styling them with an edgy knit or sweatshirt to avoid any geography teacher vibes, or a polo neck for those who want to embrace the style of years gone by. Plaid shirts may be an unoriginal look for the weekend, but this one from Frame ticks many trend boxes whilst still being super easy to wear. The fine cord shirt comes in an unexpected colour way – indigo - but is surprisingly subtle and looks great with denim. It certainly avoids the risk of looking a bit emo or like a try-hard lumberjack. As well as being made form trendy 100% cotton corduroy, it has a fringed hem adding interest and keeping the look very current. For those who don't have a spare £150 for a shirt, there are many look-a-likes on the high street, but this quality item could be worn for years to come and would work well on colder summer days too. Whether it's for hiding bad hair or for warmth, a baseball cap is a practical option for autumn’s changeable weather and is always a cool option to amp up an outfit. YouMustCreate's cord version is made from luxurious 8 wale cord and woven in Italy and has metal eyelets for interest. There's an adjustable blackstrap for comfort and it's machine washable, which is handy if you'll be using it for wintery walks. But most strikingly, it taps into two of this season's biggest trends - rust and cord, whilst being versatile enough to earn its keep in your wardrobe for next year too. Parisian students are the inspiration behind Sandro's AW18 collection and this cord jacket is a key piece. This blouson jacket is made from cotton-blend corduroy and riffs on classic varsity jackets, from the snap fastenings and striped ribbed trims to the 'Athletic' appliqué across the back. It's cut to layer comfortably over a hoodie, making it handy for autumn weather. Sandro suggests it’s styled with a sweatshirt, jeans and a simple pair of trainers. Perfect for the weekend. Aprix isn’t a brand known for slavishly following and creating trends, but instead designs retro-leaning sneakers that can be worn for years to come. This pair are made from red and navy corduroy, making them accidently trendy, while the low-top style is set on gripped rubber soles and has removable leather insoles that can be swapped out for a more cushioned pair. This means they’re super comfortable as well as stylish. The striped grosgrain tab details are a brand signature inspired by racing and sailing flags and would look great with a chunky Scandi-style knit. For those who can do smart casual at work or enjoy dressing up a little at the weekend, this Paul Smith blazer will look great with black trousers and denim alike. The olive-brown shade of the slim-fit jacket complements dark and pale colours easily, while the single-breasted style is easy to wear. The jacket is made in Italy and lined only through the sleeves to keep it lightweight, meaning it can be easily layered over a thin knit such as a roll neck for a retro look.